Running a website can be a complicated task. Content management systems (CMSs) can make that easier. Though there are a lot of CMSs out there now, one particular CMS stands out as the most popular: WordPress. WordPress is popular for a good reason, and, with popularity comes both huge benefits and significant pains. While WordPress is a great solution for most organizations large and small, it’s not perfect. If you’ve never dived into WordPress before, this brief primer will help you start on the right foot. This resource, which we’ll be updating as the technology and our understanding of it changes, will help you understand how WordPress can grow your organization and save your time. WordPress is an open-source CMS that started as a fork of an older blogging platform in 2003. For its first few major releases, it was primarily used as a blog. Since then, WordPress has evolved into a robust CMS capable of variety of functions for organizations large and small. In point of fact, you can think of it more like a web-based operating system for your business. (For those that aren’t in the know, a CMS is a program that provides an easy way to handle the content of your website without dealing with the technical hurdles. With a CMS in place, updating your website becomes as easy as using a word processor). WordPress is an open source software platform. Blah, blah… (see above). WordPress.com is a hosted site and blogging platform for less involved sites. WordPress.com sites tend to be blogs. Automattic, the company responsible for WordPress.com (which was founded by Matt Mullenweg, the lead developer of WordPress) has recently acquired the eCommerce platform WooCommerce. This could mean future eCommerce integration into WordPress.com sites. Light ecommerce platforms like Shopify and Squarespace are likely pretty freaked out. Anyways, when we speak of WordPress we’re talking about the open source version. In the last few years WordPress has become the go-to platform for some of the biggest sites on the Internet. It’s also the CMS of choice for many small and medium businesses. As of October 2015, it currently controls a almost 60% share of all websites with a CMS and a share of about 25% of sites in total. In the old days, in order to update some content on your website you’d either need to have a whole bunch of arcane knowledge about code, FTP and whatever, or you’d have to pay someone to update it for you. This could make it very expensive to maintain an active website. With WordPress (or another CMS), you can learn how to update content in less than an hour, and all you need is an Internet connection. A well-designed WordPress site means that you’ll only have to hire a web guy or web gal when you want to add major features or do a significant redesign. WordPress is an open-source technology. This means that anyone can access the source code. Because thousands of developers worldwide understand the WordPress source code, they’re able to build optional components. (This also means that thousands of hackers know the WordPress source code — more on that later). These components generally break down into plugins for functionality and themes for look (though that distinction can be a bit muddy, with some premium themes offering significant functionality upgrades and some plugins impacting visual design). WordPress isn’t the only open-source CMS, but it is the biggest. WordPress’s development community is now so big that there’s a solution for almost anything, which can save you a LOT of time and money. At the moment, there are over 37,000 free plugins available from the WordPress repository, and thousands of premium plugins offered from developers on CodeCanyon and similar sites. And even when you can’t find the perfect and unique combination of plugins to make your site purr, WordPress’s open-source nature saves the day. Most of the time, a new theme or plugin can get us 90-100% of the way to delivering what you need. When you need to make that extra 10% happen, a developer is able to custom program the rest of the way. Gone are the days of starting from scratch! Long live WordPress and its developer community! WordPress’s modularity also means that you don’t need to roll out all of your site’s features at once. 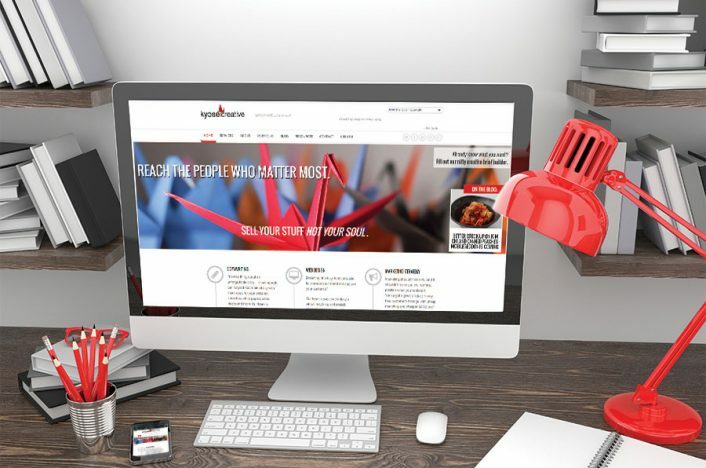 Say you need a website up for your small business, and you need it up right now. You’d like some eCommerce down the road, and maybe a custom scheduling system. With WordPress, it’s very easy to create a simple site for now and build on it later, with minimal stress. Or say you put up a WordPress-powered site in early 2011, before everything went responsive. Recent changes to Google’s algorithms will severely punish your unresponsive site. With WordPress, you could be a small theme update (or, at worst, a new theme) away from saving your bacon. You won’t have to redevelop your site, just cut away the old, parts and replace them with new ones. 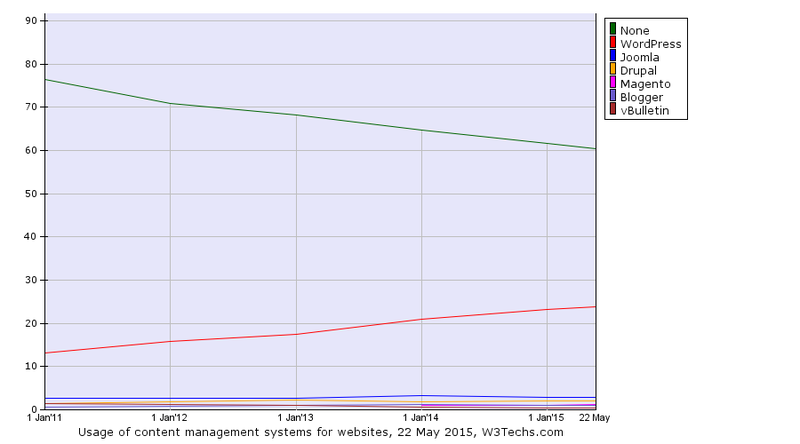 Simply put, WordPress grows fast. Because of the huge community of developers, there are plugins being developed today that solve problems you don’t even know you have. And because WordPress is so modular, your site can grow at the rate of your business. Out of the box, WordPress still looks an awful lot like a blogging platform. On a fresh WordPress site, content is divided and labelled so as to be useful to a blogger or news site (posts and pages), and it doesn’t come with a fabulous way for administrators to handle large banks of media or very large menus. The other issue is that a non-optimized WordPress site can be quite resource intensive for your server and give your users a slow (bad) experience. Both of these issues can be fixed with a mix of plugins and custom development; for instance, custom post types can be built that allow new types of content to be displayed any way you like, and managed easily from the back end. And there are a ton of great plugins and best practices that can get your site running fast, no matter the size or popularity. Check out TechCrunch, Time.com or Rolling Stone Magazine if you don’t believe us. Since thousands of developers and designers are working on WordPress themes and plugins, sometimes the feature that you want won’t work right out of the box with all of your other features. Custom plugins and full integration with other solutions can require someone who knows PHP and the WordPress core to make it work. This will, of course, cost a fraction of custom development. Just know that promises of “no coding knowledge required” generally don’t extend past the most basic, non-integrated functionality of a feature. Though most WordPress themes offer extensive customizability, they all have limits. In order to get exactly the look that you want, you may need a designer with experience in CSS, PHP and WordPress. Since these technologies are the most common on the web, you have many options. Also, many theme-providers are happy to make the custom tweaks you need – for a price. Notoriety, of course, comes with certain dangers. Since WordPress has taken over the web, it’s become a frequent target of hackers. For this reason, you must take precautions to 1) mask your usage of WordPress and specific WordPress plugins and 2) secure your site in general. Note that this doesn’t have much to do with the WordPress code itself; it’s pretty good as far as CMSs go, and when there is a security glitch, they patch it pretty quickly. However, since hackers are likely to know WordPress inside and out, they’ll be able to exploit any potential common weaknesses. Thankfully, there are many ways to lock down WordPress to make it really, really, really hard for hackers to get in. These range from basic security best practices to WordPress plugins for security to country blocking and constant monitoring. You’ll also want to pick a really good password – something long and tough to guess, but easy for you to remember. No, username: admin and password: password won’t cut it in the Wild West that is the web. Most attacks on WordPress sites come from bots that poke at known WordPress vulnerabilities. Always ask your WordPress developer/designer to make sure that those will be patched up and obfuscated. The numbers don’t lie; site-owners are migrating towards WordPress at an incredible speed. WordPress runs about one third of the web now, and aims to double its share. There’s a lot of benefit to getting your site on WordPress. But how can you move from a CMS like Joomla or Drupal (or no CMS at all) to WordPress? While a copy-paste job might do fine for your 10-page site, it can be a challenge to move a 2000-pager over. A challenge, but not impossible (we’ve done it!). Have any more questions about WordPress? We’re happy to talk – leave a comment or contact us! Post updated October 9, 2015. Deliver What Your Headline Promises. Quit Clickbait.